Ellora was raised in Frisco, Texas. Though she grew up a tomboy obsessing over animals and playing in the dirt, she also cultivated a love for music and academics. Playing in a cover band with her sister and friends, she performed around the north Texas area through middle school, set on being the next Taylor Swift. It wasn’t until 9th grade that she started seriously pursuing what had only previously been a hobby – musical theater. Flash forward 9 years, she’s now graduating this April with a BFA in Music Dance Theatre from BYU. 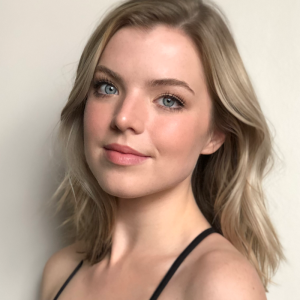 She’s performed with regional theaters in the area as well as with the BYU Young Ambassadors for two years, touring nationally to the surrounding states and internationally to Brazil and Argentina. Her favorite credits include Rapunzel in Into the Woods, Susan/Choir Girl in Company, and Joanna Wilkes in Big River. In addition to singing and performing, Ellora is passionate about getting outdoors and enjoying good food.